The City of Port Isabel will be hosting a Grand Reopening Ribbon Cutting of the Port Isabel Lighthouse on Tuesday, January 23, 2018 from 11 a.m. to 3 p.m. 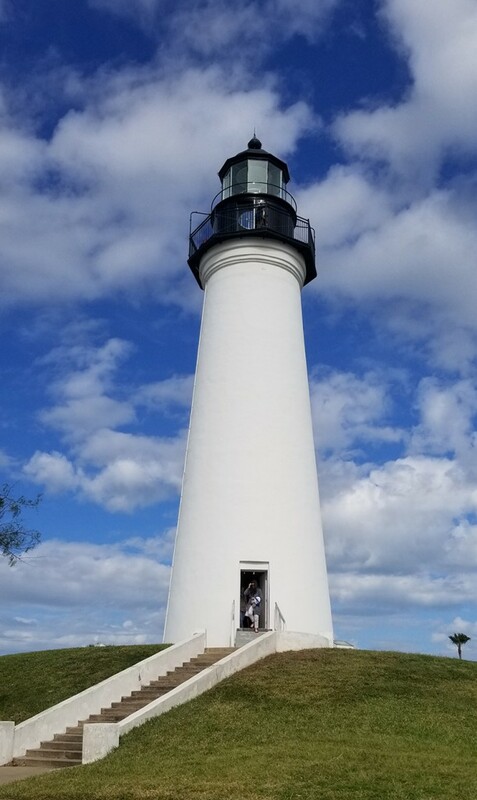 The Texas Parks & Wildlife Department’s restoration of the exterior of the tower has been completed and the lighthouse reopened to the public on January 2nd. The exterior catwalk is now accessible for visitors that want to enjoy the 16-mile, 360° view from the top of lighthouse. Open house at the lighthouse will be on Tuesday, January 23, from 9:00 a.m. to 5:00 p.m., there will be no admission charge. Festivities in the park will kick off at 11:00 a.m. with vendors on site. At 12 noon, there will be a Grand Reopening Ceremony followed by a Ribbon Cutting by the Port Isabel Chamber of Commerce. Vendors will be on site until 3:00 p.m. Hours of Operation: 9 a.m. to 5 p.m., daily (weather permitting). Tickets may be purchased in the Lighthouse, the Keepers Cottage (Chamber of Commerce & Visitors Center), the Treasures of the Gulf Museum and the Port Isabel Historical Museum. Ticket Information: The Lighthouse is part of the Port Isabel Museum Complex with also includes the Port Isabel Historical Museum in the Champion Building and the Treasures of the Gulf Museum. Combination tickets can be purchased at any museum location, at the lighthouse and at the Visitors Center in the keepers cottage and do not need to be redeemed the day of purchase. Contact: Port Isabel Visitors Center at 956/943-2262 or the Museums of Port Isabel at 956/943-7602. • Date of construction: 1852, construction was completed in 1853. • Built on the grounds of Fort Polk which was used in 1846 – 1848 during the US/Mexican War. • Port Isabel Lighthouse is the only lighthouse that is open to the public on the Texas Gulf Coast. • There are 16 lighthouses on the Texas Coast. • The Port Isabel Lighthouse is a State Historic Site owned by the Texas Parks & Wildlife Department. • The lighthouse is approximately 72′ tall. • There are 75 steps to the top of the lighthouse, including 3 short ladders. • Summer programming at the lighthouse includes the Lighthouse Establishment Cinema. Fridays at 9:30 p.m., during June and July, movies are projected on the side of the lighthouse. Free admission to the movies. • Group tours are available. Call 956/943-7602 for more information.